Single scraping agitator turning in one direction, suitable for mixing low viscosity liquids and simple heating or cooling applications, or gentle motion holding of higher viscosity products. Also known as counter rotating agitators, typically with two agitator drives turning separate agitators is opposite directions, suitable for difficult high viscosity products or those containing solids requiring distribution. Either single motion or double motion type on angles from 15 – 30 degrees, suitable for mixing products containing fragile solids that may either sink or float, high and low viscosity products. These typically start with a single scraping agitator and one or two secondary agitators are added to either side. 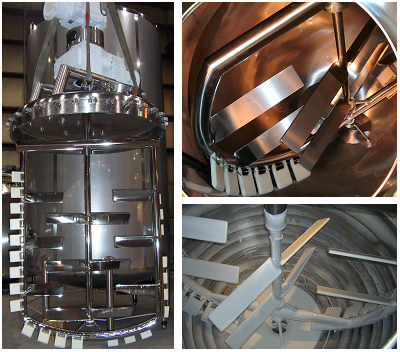 These can be counter rotating horizontal bar styles, top entry high shear mixer or even simple propeller type mixers.